NEW ORLEANS —You see them, smell them and possibly even taste them all the time. We’re talking about the sweet treat that is beignets. Thousands of people flock to the French Quarter to have a taste and powder their faces with the fried doughnut that we have come to know and love. But who is behind the sprawling empire? What makes it run, and how did a square piece of dough, fried and covered with powdered sugar, become so popular? I asked the man who makes tasting fresh, sugary beignets part of his every day job. I met Burt Benrud in the Café Du Monde Coffee Stand in the New Orleans French Market. Every morning he walks over to the cafe to test taste just to make sure everything is perfect. But that’s only a tiny part of his job as the vice president of Café du Monde. Benrud wasn’t always in the business. He married into it. He and his wife, Karen Fernandez-Benrud, live in New Orleans and have three adult children who work for the company. The Fernandez family has owned the Café Du Monde since 1942, and the business has been passed down three generations and is moving now onto its fourth. Back in the day, Hubert Fernandez owned a wine cellar across the street from the café. It was on St. Ann and Decatur. 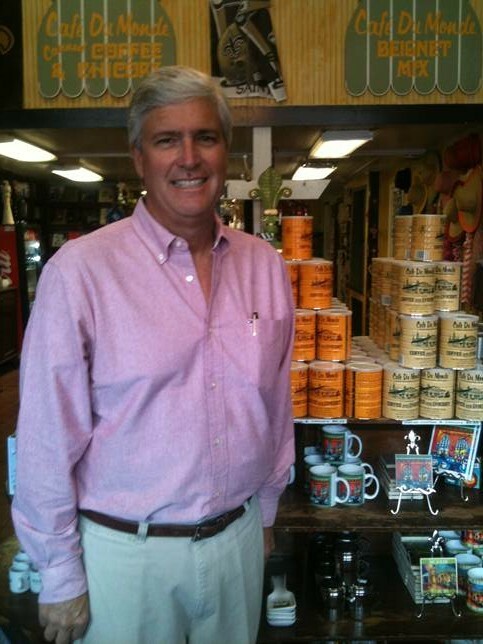 One day, Café Du Monde went up for sale and he bought it. It’s been in the family ever since. Benrud says working in a place as unique as the French Quarter, you never know what or whom you will come across. Most recently he has had WWE stars and actor Ashton Kutcher come through. “You never know who you’re going to see here or who you’re going to run across. That’s part of the fun of working here,” he says. Benrud recalls a day long ago when he ran into comedian Jay Leno. “One day I’m walking to the coffee shop dining room and there he is sitting down having coffee with his wife. He was very open with everyone. It was so fun,” he said. Right now the next priority for the business is training the fourth generation of family members to run it. It’s a company that continues to move forward. They now have nine different locations; four in the New Orleans Metro area and two on the Northshore. One thing that Benrud says never grows old is watching the smiles on people’s faces as they eat and sip while powdered sugar is everywhere. It’s a memory people take with them. Read more on WDSU’s website.